The site of Willi Gertel is the only website I know entirely dedicated to Sulcos. The site is only in German. The site of a young enthusiast of Sulcorebutia. At the moment his collection is not yet extensive ! Probably he is not very experienced but he is enthusiastic and just wants to share his passion with us. The site of a german nursery offering a good range of Sulcos for reasonnable prices. The site is in English and in German. If you want to try some seedlings you will find Sulco seeds here. The site is in English. S.S.K. (Studiengemeinschaft Südamerikanische Kakteen) is a study community. Its purpose is to contribute to the clarification of genetic relationships of South American cactus genera, preferentially Sulcorebutia, Weingartia, Gymnocalycium, Rebutia (sensu Backeberg), and Lobivia. The site is in English and in German. 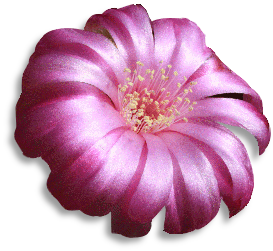 Through this website you can access to a large number of sites dealing with cacti or succulent plants. All languages. Probably the biggest French speaking site about cacti. A very pleasant French speaking site (should I say a community ?). In 2013 I told you about the Online Sulcorebutia Lexicon published by Willi Gertel. But this is just a little part of a Forum dedicated to cacti and other succulent plants. I'm a member of an association of cacti enthusiasts called "Peyote". We have a meeting in Brussels once a month to talk about our passion but we have many more activities besides. This is its site (in French). The site of a cacti enthusiast. He has watched them on the field in North and South America. And he talks about them quite well ! His site is only in French. Another cacti enthusiast who helped me a lot with his good advices. A seedling specialist. His site is in English and in French. Ashingtonia : In July 1973 Holly Gate Nurseries started the journal Ashingtonia to supplement the Reference Collection that is still today maintained at the nursery. The journal was aimed at the enthusiastic but discerning grower of xerophytic plants and was edited by John Donald. Between that date and the last issue, published in 1979, three volumes of the journal appeared containing a wealth of information including 37 new descriptions and combinations from some of the most authoritative botanists of the day, complete reviews of 6 genera, together with a host of brief articles featuring particular species, all illustrated with magnificent colour photographs. The "Cactus & Co" journal is edited by the Italian Association "Cactus & Co". The site is in Italian and in English. The "C & S Journal" (Cactus and Succulent Journal) is edited by the American Association "CSSA" (Cactus & Succulent Society of America). The "New Zealand Cactus and Succulent Journal (NZ C & S J)" is edited by the "Cactus & Succulent Society of New Zealand (CSSNZ) Inc."
The journal "Succulenta" is edited by the Dutch Association "Succulenta". In Dutch but some parts in English. "The Cactus File" magazine was published for a period of six years, providing its readers with a broad range of articles covering all aspects of the succulent plant hobby. Although the magazine is no longer published, many of the back issues are still available to purchase. The journal « Terra seca » is published by the association friends of Terra seca. It appears four times a year. Its beautifully illustrated pages offer articles written by renowned botanists as well as by amateurs, travel stories, tips and deals with cultural topics related to the study of plants, cultivation and natural environments. The Cactus Explorer is a free on-line journal available as a pdf download. It is available to everyone, there is no membership required. « Echinopseen » is published by the working group « Freundeskreis Echinopseen ». What is that group ? The group was formed in 1981 under the name "Zentrale Arbeitsgemeinschaft Echinopseen" in the former East Germany. It brought together enthusiasts of Lobivia, Rebutia, Echinopsis, Trichocereus Sulcorebutia and Weingartia. Its aim was to deepen the knowledge about these plants, study their culture and propagation. An "Informationsbrief" was published twice a year. In 1996, the group is taken over by the DKG (Deutsche Gesellschaft Kakteen) under the name "Freundeskreis Echinopseen" while keeping the same goals. The magazine is still published on a biannual basis. The group also meets twice a year in Ruhla / Thuringia. The meeting lasts a whole weekend. One can attend lectures but also exchange or buy plants. The annual subscription to the group is 20 € (21 € outside Germany). This price including 2 issues of the magazine "Echinopseen." I thank them all for their articles ! ! ! Where to buy books ? The site of Keith Larkin, an English bookseller, from whom I have personally bought several books. No problems to report and delivery is very fast. Website in English only. The website of Dr. G. Gutte, German bookshop, where I have found "Die Gattung Sulcorebutia" by Karl-Heinz Brinkmann. No problem to mention for the delivery. Website only in German but Dr. Gutte speaks English. This is a Czech website where you can buy new or second hand books, old magazines (for ex. Kaktusy) but also CD’s and DVD’s in different langages. Also possibility of links exchange.